It’s not appropriate for the government to lie to people. It is wrong for government officials — you know, the vice president, in this case — to take this nation into war based on lies. And so, again, this becomes a question of who we are as a people. And so this resolution 333, articles of impeachment against the vice president, will let future generations know that no one is above the law of this country and that Congresses have the specific responsibility to provide a check to administrative abuse of power. That’s the way the framers set this government up. The impeachment move gained strength later in the week when two congressmen, William Lacy Clay (D-MO) and Janice Schakowsky (D-IL), signed up to sponsor Kucinich’s resolution19. How did you learn that Rep. Kucinich brought impeachment charges against V.P. Cheney? 11 A search of NY Times archives shows one article for the three days, starting with April 24, the date of the impeachment resolution. 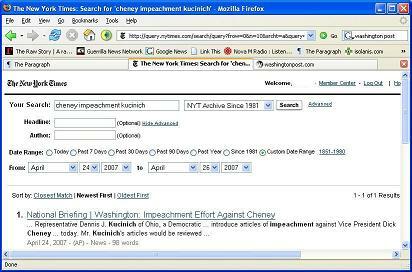 That article, written by the Associated Press, was about Kucinich’s plan to bring the impeachment resolution, and was published before he introduced it. Thanks for posting all of this up.